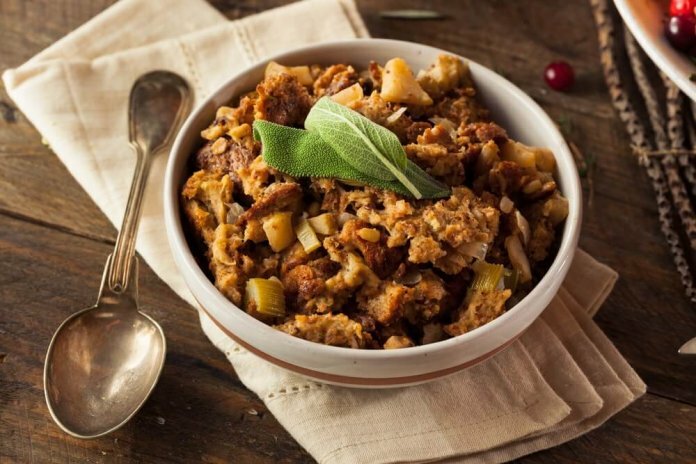 This delicious vegan pumpkin stuffing is one of many great Holiday choices on our website. Rosemary, sage, mushrooms, and of course pumpkin puree make this hearty stuffing perfect for Thanksgiving day. A quality loaf of hearty ciabatta bread will make it that much better, so don’t be afraid to splurge. 1. Preheat oven to 400 degrees. 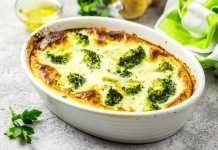 Grease a 9×13 casserole dish. 2. In a large sauté pan on medium heat, combine olive oil and butter. Add mushrooms. Cook for 5 minutes, or until they are lightly browned. Add the onions and celery to the mushrooms cook 10 minutes, until soft and translucent. 3. Add the rosemary and sage to the pan and cook 2 minutes until aromatic. Season with salt and pepper. 4. Lower the heat to medium-low. Add the pumpkin and chicken stock to the vegetables and stir to combine. Season with salt and pepper. Cook for an additional 5 minutes. Remove from heat. 5. 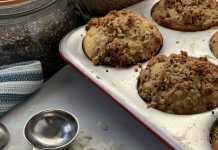 In a large bowl, combine bread and pumpkin vegetable mixture. Pour the stuffing into the prepared pan and flatten into an even layer. 6. Place the stuffing into the oven and bake for about 20 minutes, or until the top is browned slightly. this recipe is vegan. If you are not, you can use 1/2 butter and 1/2 olive oil, and chicken stock instead of vegetable.